Rahul Dravid is one of the best test batsman in the world. This article gives you complete information about Rahul Dravid. 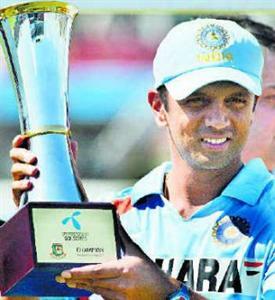 Biography and profile of Dravid is included in this article. Career history and performance of Dravid is also quoted in this article. The full name of Rahul Dravid is Rahul Sharad Dravid. Birth place of Rahul Dravid is Indore, Madhya Pradesh and currently staying in Bangalore, Karnataka. Rahul Dravid's father Sharad Dravid was working in Kissan (Jam producing company) and mother Pushpa Dravid was a architecture professor in Bangalore University. Rahul Dravid completed his schooling from St. Joseph's Boys' High School and Commerce graduation from St. Joseph's College of Commerce, Bangalore. Rahul Dravid is one of the best test cricketer in the world and currently in the Indian one day and test squad. Currently Rahul Dravid holds the record of second highest run scorer in Test cricket after Sachin Tendulkar. With his amazing defensive technique and ability to stand in the crease for a long time, Rahul Dravid is popular by the name "The wall of Indian cricket". He had played many brilliant innings for India in test cricket in many crucial situations for India to save from defeat. Rahul Dravid was born in the year 1973 January 11. Another record of Rahul Dravid is most number of catches in Test cricket. As per the latest news Rahul Dravid retirement from one day cricket announced after India vs England One day and T20 series. He is the third cricket player to attain 12000 runs in test cricket. Rahul Dravid also playes as the role of wicket keeper for many times. At the age of 12 itself Rahul Dravid shows some amazing skills in Cricket where he played under 15, under 17 and under 19 cricket events for his state. Dravid started his cricket success by scoring a century for his school team in his debut match. Dravid made his Ranji Trophy debut in the year 1991 during his college days. In that time Dravid batted at 7th position and scored 82 runs in that match. Dravid one day debut is against Srilanka and test debut of Rahul Dravid is against England. In 1996 Rahul scored his first century in South Africa tour where he scored 148 runs in the third test of that series and also awarded first Man of the match in that match. His second test century was against Zimbabwe in 1998. Dravid scored a total of 964 runs in that year. In 1999, Dravid again showed some amazing skills with his bat by scoring two centuries in both innings of a test against New Zealand with the score of 190 and 103. Dravid scored his first double century 200* against Zimbabwe in the year 1999. In 1999 Cricket world cup Dravid was the top scorer with 461 runs. Good article. What about Dravid as a captain for India ? You could have touched on this count too to have a complete picture. So also, in the career performance, Dravid the wicket keeper remains untouched. Any how, good attempt.